The Pocket Table is a discreet and minimal lined coffee table that features two hidden drawers for additional storage. Designed by Lee Mindel in 2016 as a functional and sleek living room item, the Pocket Table can be used singularly or paired with a second table for greater size and utility (four drawers). 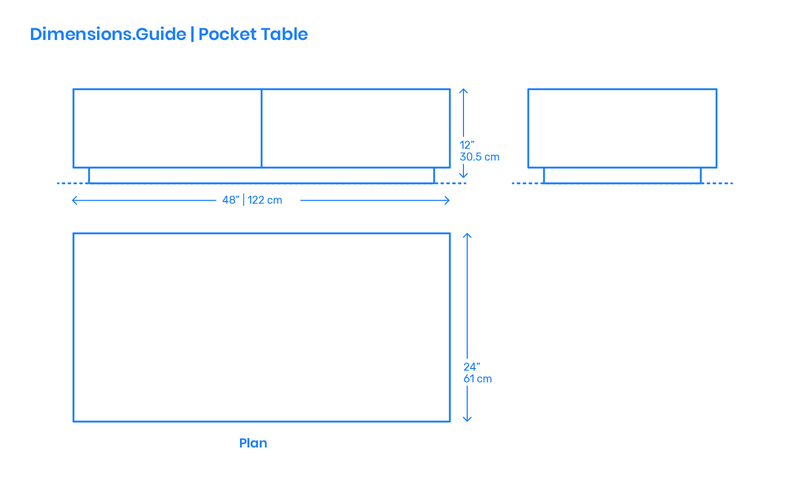 The rectangular Pocket Table has a height of 12” | 30.5 cm, length of 48” | 122 cm, and width of 24” | 61 cm. The table is constructed out of MDF with finish options in oak or walnut veneer, or white lacquer. What is the Pocket Table? The Pocket Table is a discreet and minimal lined coffee table that features two hidden drawers for additional storage designed by Lee Mindel (2016). How big is the Pocket Table? The Pocket Table has an overall length of 48” | 122 cm, width of 24” | 61 cm, and an overall surface area of 8 ft2 | .7 m2. What height of sofa should be paired with the Pocket Table? The Pocket Table has tabletop height of 12” | 30.5 cm and should be paired with sofas with similar seat heights between 12”-14” | 30.5–35.6 cm.